Reach the pay desk Ferleiten from Salzburg in approx. 1.5 hours via the Tauern Autobahn A 10 and the Bundesstrasse B 311. Start your individual mountain fun here. We will introduce you to six of the most popular destinations along the Grossglockner High Alpine Road for your daytrip. The crowning finale of the daytrip is the Kaiser-Franz-Josefs-Höhe, but more on that later! It’s up to you whether you take the same route back to Salzburg or continue driving to Heiligenblut. Who knows, your daytrip might even turn into a short holiday. Numerous information points, exhibitions, museums and themed and panoramic trails along the Grossglockner High Alpine Road are waiting to be discovered by you. Choose your personal focus from among the twelve adventure worlds depending on your interests. Our suggested daytrip introduces you to the top 6 destinations along the popular mountain road! You absolutely must visit this unique exhibition about alpine ecology at the stone-wall construction camp dating back to when the Grossglockner High Alpine Road was under construction. Things worth seeing include the exhibition “Kristalle – Schatz der Hohen Tauern” (Eng. “Crystals – Treasures of the High Tauern”, the Murmi marmot show and the educational plant trail “Welt der Flechten im Hochgebirge” (Eng. “World of Lichen in the High Mountains”). Reach the highest point of the Grossglockner High Alpine Road via the access road, which branches off the main road. 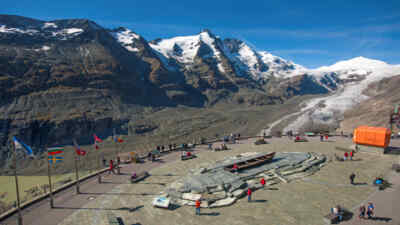 The 360* panoramic vantage point allows your gaze to wander over more than thirty 3,000 metre peaks – and even the north side of the Grossglockner. Return to the main road from the Edelweissspitze and drive on to the small mountain lake with the Mankei innkeeper Herbert Haslinger. Here you can see tame marmots that the innkeeper looks after himself. Aside from the animal company, you shouldn’t miss a fluffy plate of Kaiserschmarrn. In olden times, high and exposed spots were thought to be gateways to the underworld. The Hochtor underworld consists of a tunnel with the provincial border between Salzburg and Carinthia running through its middle. The exhibition Passheiligtum Hochtor (Engl. “Hochtor Pass Sanctuary”) creates mystical moments. Cool off with a snowball fight, more often than not even possible in midsummer. Depending on the season, a see of colourful flowers and light green or golden larches are waiting for you on the south side of the Grossglockner. Display boards help you to identify the plants, while the playground explains how an egg becomes a butterfly in a manner that is appropriate for children. Our tip for families! The vantage station, which the Emperor himself visited, thereby giving it its name, is the final destination of your daytrip. 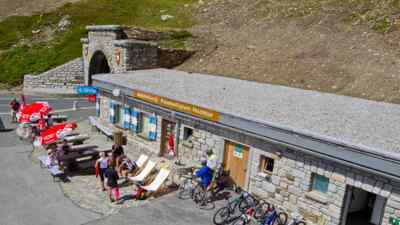 Park the car in the free underground car park and enjoy the view of Austria’s highest mountain, the Grossglockner, which towers above the 8 km Pasterze with a total height of 3,798 m. The snow-covered Johannisberg greets you from the end of the glacial lobe. Now you can go on to discover the modern visitors’ centre with its exhibitions, observe ibexes at the Swarovski look-out or embark on a journey to the Gamsgrube (daily: free tours with a National Park ranger!) or onto the glacier. It’s also worth driving back towards Salzburg on the same route. The change in perspective affords you several views that will turn your return drive into an impressive experience. Alternatively, continue driving to Heiligenblut and simply add another day to your daytrip. 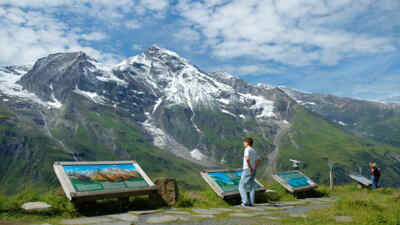 You’d like to learn more about the sights along the Grossglockner High Alpine Road? Then you should discover the twelve adventure worlds on the Glockner!